A newspaper article published by The Lion's Tale, Oviedo High School's student newspaper, in February of 1984. This article is about OHS honor student Belinda Bakalla, who was designated a Tusculum Scholar. Tusculum College in Greenville, Tennessee, awards each Tusculum Scholar a scholarship that covers tuition in full. 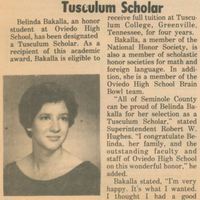 Original newspaper article: "Bakalla Designated Tusculum Scholar." The Lion's Tale, Vol. XIII, No. 5, February 1984: Private Collection of Dan Beistel. 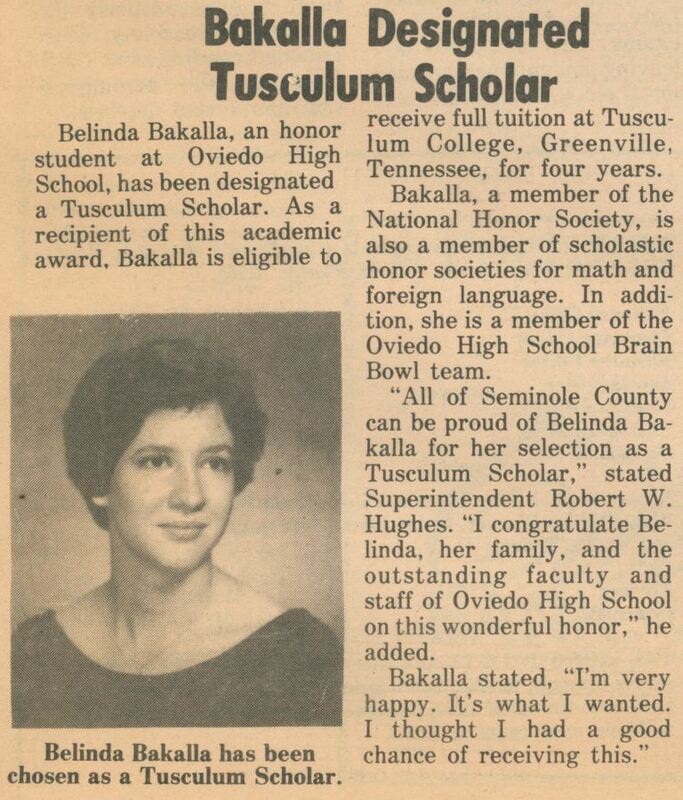 Digital reproduction of original newspaper article: "Bakalla Designated Tusculum Scholar." The Lion's Tale, Vol. XIII, No. 5, February 1984. “Bakalla Designated Tusculum Scholar.” RICHES of Central Florida accessed April 24, 2019, https://richesmi.cah.ucf.edu/omeka/items/show/5269.